Globally, the maternal mortality ratio nearly halved between 1990 and 2015. However, progress was patchy, with only nine countries with an initial maternal mortality ratio greater than 100 achieving the Millennium Development Goal (MDG) 5 target of 75% reduction. 26 countries made no progress, and in 12 countries— including the USA— maternal mortality ratios increased. A woman’s lifetime risk of dying as a result of pregnancy and childbirth remains more than 100 times higher in sub-Saharan Africa than in high-income countries. Deaths of newborn babies have also declined at a slower rate than those of older infants and children, and stillbirths remain high. Prof Wendy J. Graham, Professor of Obstetric Epidemiology, Department of Infectious Disease Epidemiology London School of Hygiene & Tropical Medicine and a leading author in the Series notes that the new Sustainable Development Goals target for maternal health necessitates that the rate of progress in SSA must accelerate markedly if the goal is to be reached by 2030. “It is crucial that maternal health receives high-level political commitment from leaders across SSA in order prioritise the essential resources required (from the health sector and more broadly e.g. transport & communications), and governments must be held to account for delivering on their promises to women and their families”, she notes. Achieving progress in this area, notes Prof Wendy, will bring massive social and economic benefits to countries – in the long and short-term. 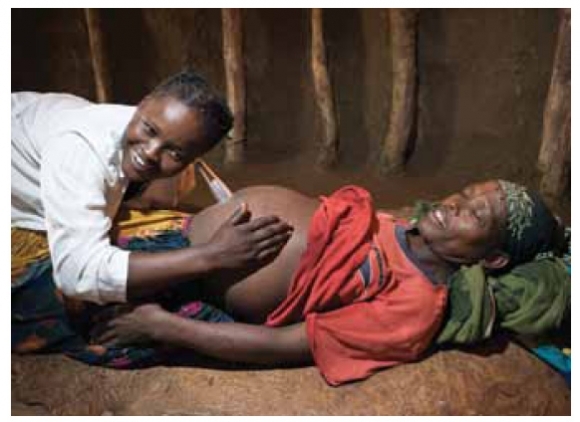 There are several SSA-specific initiatives – such as CARMMA, and Beyond Zero Campaign in Kenya which are seeking to maintain the momentum for maternal health in the post-MDG period. According to authors, the Series issues a call to action, with five main priorities: Prioritising quality maternal health services that respond to local needs, promoting equity through universal coverage of quality maternal health services and improving the health workforce. The Series further urges governments to enhance facility capability, guarantee sustainable financing for maternal and perinatal health, and better evidence on the burden of poor maternal health on coverage and quality of services. These five priorities, says Prof Wendy are inter-linked and all are needed, but in terms of point 1 (quality) and point 2 (equity), a bit more elaboration can be given. The Series discusses the quality gap in all six papers published as this is such a key obstacle to progress in improving maternal health and survival. Quality care is care which is effective, safe and a good experience for women. Unfortunately evidence from several sources for Sub Saharan Africa shows many women continue to receive care which does not meet basic standards, and indeed can be harmful and disrespectful. “A particularly important area of care is at the time of delivery, and across SSA – there has been a dramatic shift in place of birth, with many more now delivering in health facilities. However, the quality of care these women receive is often poor – both in terms of the availability and capability of health workers, and the essential infrastructure and supplies, such as water, electricity and drugs”, notes Prof Wendy. Data suggests this shortfall applies to all types of public facilities – from small maternity units to very large tertiary hospitals. Improving the quality of care is essential to saving lives and resources (healthcare and societal), and is the opportunity for countries in SSA to accelerate progress. This means, said Prof Wendy, services need to be strengthened to meet local needs, addressing shortages and limitations in healthcare workers, commodities, emergency transport and infrastructure, and information systems must be improved to routinely monitor standards of care and to hold services to account. Evidence shows the poorest women in all countries have the lowest rates of utilisation of services and when they do access care, they are likely to receive poor quality services. Targeted action is needed to reach the most vulnerable women, particularly where there is fragility, such as in conflict-affected areas or where there are environmental challenges (see paper 5). According to Prof Wendy, this particularly important for the women who live in the many fragile states in SSA. “Meeting the needs of pregnant women for good quality care is particularly challenging here, and strong advocacy is needed to ensure these special cases are not forgotten,” she notes. The equity gap exists in terms of both the burden of poor maternal health and poor access to quality care, with women of low educational status and low wealth being most marginalised, and the gap can be particularly severe for remote rural populations. “Every woman, everywhere has the right to good quality care for herself and her newborn,” asserts Prof Wendy. One way this could be achieved according to the Series is for African governments committing to universal health coverage—ie, high-quality services available for every woman, everywhere to curb the persistent maternal health challenges now that most are either implementing the sustainable development goals or in the process of doing so, a new Lancet Series reveals. According to the Series, maternal health improvements will influence, and be influenced by achievements within the wider continuum of care; those working on non-communicable diseases, infectious diseases, nutrition, and mental health; and in relation to other SDG targets, from those aimed at ending poverty to those building resilient infrastructure. “Leaving no one behind” is a key slogan in the well-emphasised SDGs of greater equity, but will such promise reach these populations left behind with a disproportionate burden of poor maternal health? Universal health coverage is the core mechanism for achieving SDG 3, with linked objectives around quality and availability of care, matching uptake with need, and improving cost-effectiveness and financial protection. Every universal health coverage initiative should include a strong maternal health service core and ensure that it reaches every woman, everywhere with quality care, and without causing financial hardship and pushing families into poverty,” authors of the Series say. This response will require unprecedented collaboration with a wide array of partners to improve equitable access to efficient, high-quality, and respectful maternal health care with functioning referral systems. It will require a fundamental shift towards care-centred on the woman and family, with better linkages across reproductive, maternal, newborn, child, and adolescent health, and more, as non-communicable diseases and other maternal illnesses become apparent. A recent analysis echoed these concerns, projecting that between 2013 and 2040, only 3% of low income countries and 37% of middle-income countries are likely to reach the goal of 5% of gross domestic product spent by the government on health. Advocates should leverage the consensus statement on domestic resource mobilisation that emerged from the 2015 Conference on Financing for Development in Addis Ababa to campaign for improving countries’ tax policy and tax administration. Options to explore include sales’ taxes on alcohol and tobacco, tourist taxes, and redirecting fossil fuel subsidies to health. Human resources are a glaring challenge to health systems in all countries, especially low-income and middle-income countries. The numbers of skilled health professionals (ie, midwives and physicians, and others such as anaesthetists); and their composition, deployment, retention, and productivity are dynamic yet crucial variables in ensuring universal access to sexual, reproductive, maternal, and newborn health. In sub-Saharan Africa, infectious diseases, such as malaria and HIV, take their toll on maternal health and contribute to the burden of perinatal deaths. In settings with fewer of these infectious diseases or fewer deaths due to traditional direct causes, non-communicable diseases and mental health become more prominent, often in relation to older motherhood and obesity. In such contexts, if prevention is unsuccessful, effectiveness of maternity services will increasingly require integration across health-care services and linkages between levels of care in the next 5 years to achieve the Sustainable Development Goal (SDG) target of a global maternal mortality ratio less than 70 maternal deaths per 100 000 live births by 2030, with no single country having a maternal mortality ratio greater than 140 maternal deaths per 100 000 live births.